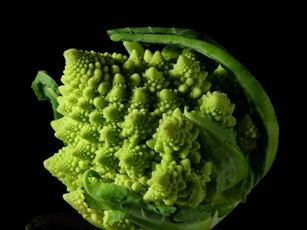 Broccoli comes in two forms, the first type is known as 'Calabrese' or Italian Broccoli. Calabrese has one large central floret, it is sown in late Spring and harvested in late summer. The other type of Broccoli is often referred to as 'Sprouting'. This type needs a far longer growing period. It is planted one year and is harvested in the mid-winter period of the following year. Both sprouting broccoli and Calabrese need a good, compost rich soil. If your soil is not rich enough give it a good tonic by adding lots of mature manure and compost. 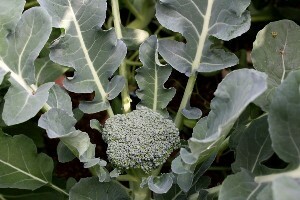 Sow Sprouting Broccoli under cover in late winter in seed trays or 7.5cm (3 in) pots, or outside in seedbeds in spring. Sow seed 1.5 cm (1/2 in) deep in drills 15cm (6 in) apart, and thin to 10cm (4 in). Move the seedlings to their growing positions when they are roughly 10-12 cm (4-5 in) high, and place them 60cm (2 ft) apart, in rows 60 cm (2 ft) apart. Calabrese does not like to be moved once sown. Generally it is sown direct into its final growing place. Sow seed 1.5 cm (1/2 in) deep in Spring, two or three seed to each sowing spot, 15 – 20 cm (6-8 in) apart, in rows 20 cm (12 in) apart. Get rid of weaker seedlings over time, the strongest will then continue to flourish. Make successional sowings, this means that you sow some Broccoli every week, for a few weeks until early summer to prolong the harvest. Make sure that sprouting broccoli seedlings are regularly watered until they are well established. As the plants begin to get larger keep them free of weeds. Protection from insects or birds is also very important, so cover your plants with fleece or protective netting. 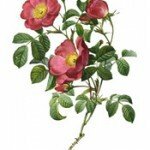 Your plants will be ready to harvest from mid winter the following year. When harvesting time comes round, pick the central spear of the Broccoli plant first, it should be about about 10cm (4 in) long at this stage, and continue to pick the sideshoots as they get larger. If you continue to pick the spears every few days you are making sure that the plant will continue to crop over the next seven or eight weeks. Water calabrese seedlings well, especially in dry summers. Make sure that the plants a good soak a month or so after planting out to improve the yield. Cover with fine netting or horticulture fleece to protect from caterpillars. The first plants will be ready midsummer. Seed will germinate in about 1 to 2 weeks. Stored seed should be okay up to 4 years.